This guide (listed below) is designed to give information about specific American piano manufacturers and more, during the last 183 years or so. Antique Pianos, Grand Pianos, Upright Pianos, Square Grands Pianos, complex machines with thousands of moving parts, are also works of art. Pianos are known for their durability, but over time gradual wear and deterioration take a toll on the condition of all pianos, whether regularly serviced or not. Antique piano restorations and the restoring, rebuilding, refurbishing and reconditioning of antique pianos are many ways in which the piano can be put back into a playable and usable condition. This extensive work is recommended for most high-quality and well made instruments from the past as these unique and highly valued instruments should be preserved for all future generations to enjoy and appreciate. This is only a partial listing of more than 200 piano manufacturers during the 19th & 20th century’s. We have gathered information for some of them from our own experiences. If you have something to add please contact us with your piano information. This page is ever changing so check back occasionally for updates. Ampico 1916 New York A reproducing system for player pianos of many makes. Apollo 1901 DeKalb A quality reproducing piano manufactured by the Welte Player Piano Co.
Hobart M. Cable 1900 La Porte The budget model line of the Story & Clark Piano Co.
Cable Nelson 1903 Chicago The low priced companion of the Everett Piano Co.
French Jesse 1875 Nashville Invented the Dulcet Tone whereby a damper will leave one string open, thus creating a peculiar sympathetic tone quality. Gabler 1854 New York Mr. Gabler was a very hands-on factory owner, spending many hours each day overseeing his production. Lester 1888 Philadelphia Introduced plastics in their pianos after WWII causing many problems. Fortunately this problem can be remedied if you purchase an older Lester Piano. Marshall & Wendell 1836 Albany Highly sought after in the used piano market, especially if equipped with an Ampico Player Unit. Mehlin & Sons 1889 New York Famous for their beautiful artistic cases. Petrof 1864 Hradec Kralove Produced in the Czech Republic. Schimmel 1885 Leipzig Europeans largest piano maker. Waldorf 1896 New York This piano company controlled the production of the AutoPiano Co.
Wissner 1878 New York Owned by Mr. Otto Wissner who was another tireless executive with a high ambition to excel. A reproducing system for player pianos of many makes. A quality reproducing piano manufactured by the Welte Player Piano Co. The budget model line of the Story & Clark Piano Co. The low priced companion of the Everett Piano Co. Invented the Dulcet Tone whereby a damper will leave one string open, thus creating a peculiar sympathetic tone quality. Mr. Gabler was a very hands-on factory owner, spending many hours each day overseeing his production. Introduced plastics in their pianos after WWII causing many problems. Fortunately this problem can be remedied if you purchase an older Lester Piano. Highly sought after in the used piano market, especially if equipped with an Ampico Player Unit. Famous for their beautiful artistic cases. This piano company controlled the production of the AutoPiano Co. Owned by Mr. Otto Wissner who was another tireless executive with a high ambition to excel. An automatic piano player in a cabinet with reeds for organ or keyboard was patented in 1897. They were marketed with the “Aeriol Pianos” name. T.P. Brown , who is given the credit, sold the patents to the Aeolian Company. The Aeolian Company established a factory for making pianos in Gotha, Germany for Steck pianos and later built a factory near London to make the Weber pianos. Albert Weber from Bavaria came to New York, age 16, and began soon to have the name of a thorough piano maker as well as a perfect performer. He spared no expense to have the best workmen and talent to make pianos giving him the name of a second to none . He succeeded in producing the “Weber tone.” Continued work and strain of doing so much by himself brought his early death. The fame of the Weber piano still continues for its quality. The American Piano Company of New York is the combination of several factories under its leadership. Factories such as Chickering, Knabe, Haines, Marshall and Wendell, Foster, Armstrong, Brewster and Cook. It has warehouses in New York, Boston, Baltimore and Washington. It distributes its products through dealers. 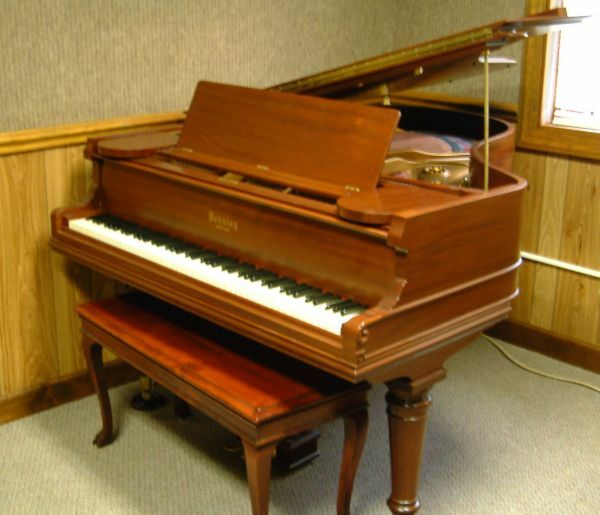 This company has produced a player piano of distinctly original construction and quality. It began because of the demand for a reliable player action. Now it is one of the largest producers of player pianos. The Bacon Piano Company is one of the founders of the piano industry in America. It began in 1820 with Robert Stodert and after George Bacon died, his son Francis entered as a partner in 1904 when the company took the name of Bacon Piano Company. In 1866 D.H. Baldwin was a music teacher selling Decker Brothers pianos in Cincinnati. In 1873 this business became D.H. Baldwin and Company. Expansion was begun with stores in other cities. Hamilton Organ Company being organized, but later becoming incorporated into the Baldwin Company. After Baldwin died, his two partners, Wulsin and Armstrong, began the development of the artistic Balwin piano. The manufacturing plant is kept scrupulously clean and decorated with architectural design. At the 1900 Paris Exposition , Baldwin took the highest prizes as in most cases where it is presented. The Baldwin piano is an art product, its tone boundless. Jacob Becker went from Germany to Russia where he established his business in 1841. He was a thinker and experimented with innovations. His concert grands were excellent and used by leading virtuosos. He retired in 1871, but his business continued receiving appointment as purveyor to the Emperors of Russia and Austria, king of Denmark and Grand Dukes of Russia. The business continues under Carl Schroder. Born in Germany, Henry Behning learned piano making and came to America in 1856. Including his son in the business in 1880, they became Henry Behning and Son, which was changed to Behning Piano Company after his death. This company makes a good commercial piano. The Behr Brothers Piano Company is located in New York and manufactures meritorious pianos. Established in 1930, Douglas Grover, who originally began building pianos in 1906 under several different names, finally started the Bentley Piano Company with his son immediately following the success of his overstrung design in a grand piano frame. The company stayed within the family until acquired by Whelpdale Maxwell and Codd Ltd. in 1993. And more recently, in 2003, the Bentley name was acquired by InterMusic of Dorset, England. All Bentley pianos are produced solely in England. Julius Bluthner of Leipsic used the Conservatory of Music to his advantage by informing the world by the students as they went out into the world that the Bluthner pianos were such high quality. He received prizes from the world’s expositions for his new concept of piano. He begun his study under Bretschneider, a builder of grand pianos. The Bluthner art grand is impressive with its boldness in design. Bluthner had excellent hearing and could “voice” a piano better than anyone. He developed the “Aliquot System,” a system to enhance volume and quality of the upper octaves. He also invented a grand action. He was honored by rulers of several countries. Bluthner co-authored a book in German on the care and construction of the piano, materials, tools, and machinery for making the piano. Ludwig Bosendorfer of Vienna built concert grands 10 feet in length containing 8 octaves. Among the names of grand , grand pianos is that of Bosendorfer. The son, Ludwig, improved on the grand of his father by accepting modern ideas while keeping the Vienna tone. These pianos are preferred by leading virtuosos and ranks foremost in artistic pianos produced. 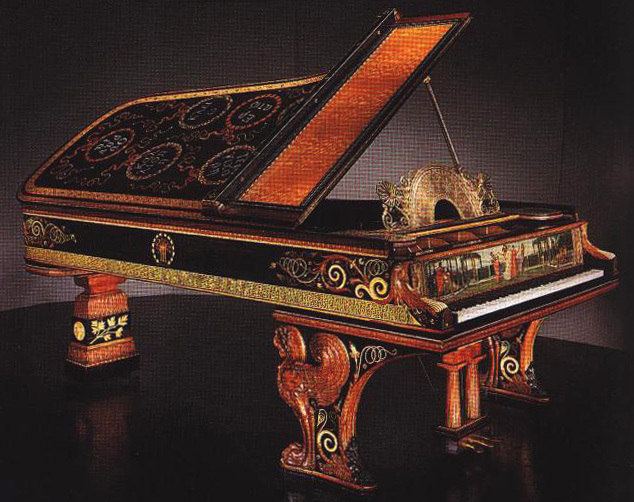 The Emperor of Austria conferred highest honors on the younger Bosendorfer. The Vienna piano and organ makers have an association for themselves. Ludwig Bosendorfer is the only honorary member. John patented in 1827 a combination iron string plate for the grand piano with iron bars which was almost a full iron frame. He had made in 1791 a square piano. John was born in Scotland but came to England where he married a piano maker’s daughter eventually gaining control of the company. The business of Broadwood was a gathering place for leaders in his field. He gained much from their intellect. After his death his son James took control. He continued the gatherings including Beethoven, who greatly loved the Broadwood piano. Henry Fowler Broadwood succeeded James with the same inventions and intellect of friends. Chopin gave his last recital in England at the Broadwood house. Walter Stewart and Thomas Broadwood joined the Broadwood business. Six generations have guided the Broadwood name. They once had taken the lead in England with player pianos. Every part of their player pianos are manufactured within their own factory. Broadwood now makes a barless steel frame for the grand and upright pianos. This permits the soundboard and strings to vibrate unhampered. William H. Bush born in Maryland began using the railroad to transport vegetables from his fathers’ farm to market. He then had a lumber yard in Chicago which burned. Finally he went into partnership with his son and John Gerts to manufacture pianos. The younger Bush had studied with Woods and Company and with Kimball Company. John Gerts learned piano making in Germany. The Bush Temple of Music is a tribute to the elder Bush. The Conservatory of Music is a tribute to William L, the younger Bush. Bush and Gerts Piano Company upholds and defends the ethics of the piano business. The company insists the makers name should be on every piano and a fixed price shown by the maker. Bush and Lane In the U.S., this is one of the manufacturers of high –grade pianos in the west. Cable began a career in teaching but later joined the Wolfinger Organ Company. He used his previous work to the piano production joining with Conover. His business advanced, but after his two brothers joined him and his work drained him, he died. The business became known as the Cable Company which in 20 years was a leader in the U.S. Chase, A.B. The Chase company began by making organs. Calvin Whitney began the company with $400. Ten years later he was making pianos and made the aristano grand player piano. Calvin’s son has taken over the company. The Chase Piano started in Indiana, joined with Hackley Piano Company a few years later and they became leaders from the Muskegon area. Babcock had a full iron frame for the piano . Jonas Chickering improved it and was granted a patent for it. He was a mechanical genius. At the World’s Fair, London, 1851, he showed the first American pianos in Europe receiving highest honors. Chickering Hall in New York was his use of concert work. Jonas had talents for inventing and constructing. He worked out all details before beginning with the mechanics. His factory burned, but he rebuilt and now is considered one of the best for its purpose. Chickering had educated his three sons in piano making. The oldest died prematurely. The second son was not in good health. He took a voyage to India and took pianos which he sold, thus becoming the first exporter of American made pianos. Chickerings son went to London with his father where he acquired great knowledge of the pianos. Chickering Hall was built in New York where many musical greats made use of the Chickering pianos. It later was demolished for other businesses. George Chickering was the youngest of the sons. He was highly educated and took over the company.. They are reviving interest in the clavichord and the music of Bach and others who wrote for the clavichord. Myron A. Decker worked in the same shop as Albert Weber, going to work later for Boardman and Gray in New York. In 1858 State Fair, Decker received best piano exhibited. He was more concerned with design and build of an artistic piano than in making money. His son and grandson took over the Decker and Son company. Frank, son of Myron became president of the National Piano Manufacturers’ Association of America in 1908. Sebastian Erard was from Strasburg, a very intelligent person with tools and inventions. He began working with a harpsichord maker in Paris. He learned and made instruments to assist him in building the harpsichord. He built a piano in 1777, superior to any other for the Duchess of Villeroy. With his brother Jean, they began building pianos. He was not a member of the piano guild but because of his friends in the French court of the king, he was given special permission to continue building pianos. The French Revolution drove him to London, but he did well there also. He copied the English with a square grand. Jean managed London office. Sebastian’s nephew Pierre became sole heir when jean and Sebastian died. Pierre received a patent in England for repetition or double escapement action, part of which Sebastian had attempted. The Erard pianos had brass agraffes which improved tone. This capo d’ astro was later patented by Pierre. When a good piano is established, the name on the fall board is never changed even if the founder is no longer connected with the firm. So is the name Erard. Jacob Estey, born in New Hampshire, learned early to work hard. He worked on a farm but winters being harsh, many did inside projects. Jacob became a plumber, but later became famous in Vermont for his organs which were sent worldwide . A man named Fuller helped Estey. Jacob included his son in the Estey Organ Company.,They manufactured 1800 per month. They also made pianos of the same superior construction and workmanship as the organ. Julius was the son of Jacob and under his management began building large church organs. He had two sons who eventually came into the Estey Company. The Sheraton grand is made by the Everett Company. This company was started in Boston by John Church who chose Everett as its name because of its simplicity. After many years of hard work the Everett piano is recognized as an artistic piano and the concert grands were used by leading virtuosos. Fazioli Pianoforti quickly built a reputation for producing top tier pianos. At the relatively young age of 35, the Fazioli Pianoforti corporation is already considered to be one of the most prestigious piano makers in the world. Their F308 – a 308 cm (10’ 2”) grand piano – is the largest piano available on the general market. Prized for their incredible design and subsequent massive sound, Fazioli pianos have been showing up most recently in major piano competitions. Out of the last 6 winners of the 3 most prestigious piano competitions – the International Chopin Piano Competition in Warsaw, the International Tchaikovsky Piano Competition in Moscow, and the Arthur Rubenstein International Piano Master Competition in Tel Aviv – 5 played on a Fazioli. Fazioli is a relatively small company, producing somewhere between 120 and 130 pianos a year, all hand made in Italy. Carl Fischer came from Vienna. His sons came to New York in 1840. They founded J & C Fischer Company. Carl had been taught by his father. John wanted to return to Italy upon retirement. Charles and his four sons then became the company. Before the corporation in 1907, the business was producing 5000 pianos a year. The Gulbransen-Dickinson Company is known for its player piano. Dickinson was continually improving and simplifying the mechanism of the player piano. Napoleon Haines and his brother Francis came to America from England when Napoleon was eight years old. At 15, he began learning the art of piano making and soon he and his brother started the Haines Brothers Piano business. They built two pianos per week. Later they built a factory where twenty pianos per week were built. Napoleon was an inventor and a very good businessman. After his death, the business merged with American Piano company who built the Haines Brothers Pianos. Hallet and Davis was first known in Boston as Brown and Hallet. Brown came from the Chickering Company where he had several patents for his work. After Davis died , the business continued with Kimball as president. Hugh Hardman came from England to New York City and became the first company to manufacture good commercial upright pianos. Later this became Hardman, Peck and Company. Henry Hazelton began his piano business in New York where he maintained the respect and friendship of his competitors. He joined with his brother Frederick as F & H Hazelton, but later was joined by another brother John which brought about the name of Hazelton Brothers. The New York Knickerbacher aristocracy kept them in business. 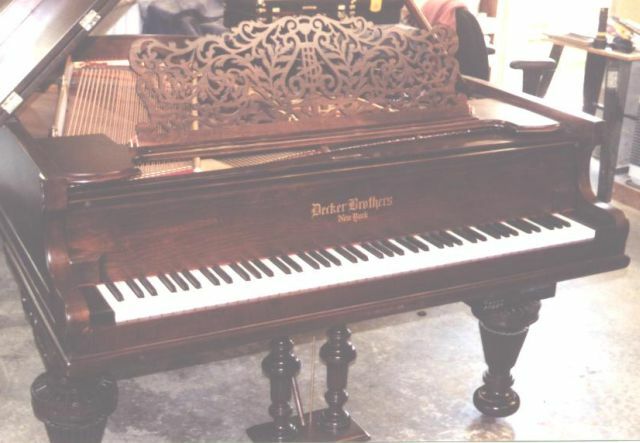 Ivers and Pond is one of the companies which maintained the traditions of famous Boston makers as they continued to produce pianos. William Wallace Kimball was born in Maine, and came to Chicago where he became a piano dealer. He soon became the largest piano dealer in the West. The Chicago fire of 1871 destroyed the warehouses. Kimball began again using his house and barn until he could rebuild. Hale of New York offered to lend him a large sum of money. E.S.Conway began working for Kimball. He traveled and eventually this gave Kimball the entire west for his territory. Kimball decided to manufacture his own pianos . He already built Kimball organs. Lufkin, a nephew, became manager of the manufacturing. They produce all parts of the piano, the player piano with music rolls, the parlor organ and the church organ.. When Kimball died, the business continued in able hands trained by Kimball. Charles Kohler began the Auto-Pneumatic Action Company in 1900 for making a reliable player action for the piano. Danquard helped Kohler and obatained a patent for the “flexible finger.” This means the wippen of the action is attached to the player mechanism. John Campbell was a factory organizer and business man. The two men worked together well. Simon Krakauer from Germany was a violinist and orchestra conductor and manufactured pianos in America with his son. They pursued quality and musical tone. Daniel later joined the company and the name became Krakauer Brothers. This piano company in New York is known for meritorious pianos. William Lindeman born in Germany, had to fight the prejudice toward German people when he came to New York and began piano making. His son, Henry,made the “cycloid” piano, a part grand and a part square piano. He made pianos in New York. Healy was a thirteenth child of Irish parents who came to America when Patrick Joseph was ten. He worked the bellows for a church organ in Boston, and worked his way into the music publishing house. He was a systematic worker keeping good records, and statistics to guide him in his work. Healy had success in making guitars, mandolins and other instruments. His harp became notorious where orchestra music was played. He also produced church organs. After Healy died, his son took over the business and included the making of pianos. The tension resonator for pianos was patented by Gertz but used by Mason and Hamlin in all grand pianos. Hamlin discovered the “voicing” of organ reeds. He joined Mason and together produced the “organ harmonium.” Their instruments are almost flawless. They produced the American Cabinet Organ which won highest honors at World’s Expositions. They built pianos of the highest quality. An invention using downward striking actions in pianos was one in which time and talent was wasted. He patented a hammer-covering machine but it was too light in construction to make the heavy hammers needed for concert grand pianos. Mathushek also experimented with double soundboards. Also the thickness of the soundboard was checked for quality tone. Mathushek traveled through Germany and Austria observing piano making, ending up in Paris. He built an octagon “table piano.” He eventually came to New York becoming associated with Dunham where he drew a scale for overstrung square pianos. Here too he made a piano hammer-covering machine. The Mathushek Piano Company in Connecticut showed his best work. He invented the linear bridge and equalizing scale for his “Colibri” piano. He could produce a tone quality that no one else could achieve. He could play the piano well and detect the slightest imperfection. He strove to produce the ideal musical tone. His orchestral square grands came near to this desire. Very prominent in Boston was the Henry F. Miller and Sons Piano Company. Miller was a musician especially an organist. He made the successful “Miller” piano and his five sons joined him in the business. After his death the sons continued the business with improvement to the piano case. Born in the Black Forest, Germany, Hugo Sohmer was educated in music. He came to New York at sixteen where he established the Sohmer and Company. He endeavored to produce an artistic instrument rather than producing quantities. James S. and Benjamin Starr, brothers, obtained control of the piano business where they were employed and used the names Starr Piano Company. James eventually retired. Benjamin was over the manufacturing. He saw the small business expand to produce 18,000 pianos a year before he died. Steck devoted his life to the improvement of the piano. Born in Germany, he studied the piano, coming to America where he started a factory. He opened Steck Hall in New York City where leading artists played his concert grand pianos. He was the best scale drawer. His pianos are of such solidity they have become know as the “school piano.” After retirement he desired to build a piano which would be permanently in tune. He died before achieving this goal. New York, 1855 World’s Fair saw the Steinway and Sons square grand piano with overstrung scale and full iron frame. It had overcome the metallic quality of tone. This design was eventually used by all American makers. Steinway and Sons patented this design. In making the covering for the hammers Steinway used 1 3/4 inch thick felt. With the hammer maker the felt is thinner and more uniform. Felt hammers flatten out with use. Steinway saturated the felt about half way up with a chemical solution which hardens the felt and thus prevents the flattening. This is still done today and is one of the major differences between New York and Hamburg Steinways. Steinway knew he must put music in front of people thus gaining sales for pianos. He built Steinway Hall in New York and in other cities of the United States where music was performed. At the White House in Washington, DC is the one hundred thousandth piano built by Steinway and Sons. It was given to President Roosevelt for the American people. The cost was about $ 20,000.00. Steinway and his three sons company progressed rapidly. Steinway built a factory in New York and would not permit any part of the factory to have any imperfection in it, so as his pianos. Two of his sons died and this took a toll on Steinway. He died in 1871 leaving a revered name. His oldest son took over the company. He was an inventive and constructive genius. He made the Centennial concert grand-duplex scale, bent rim case, cupola iron plate and action to lift the heavy felt covered hammer. A Steinway village began with the factories, iron foundry, and sawmills for building the pianos. 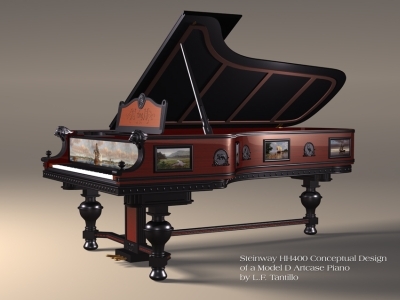 Many honors have been awarded to the Steinway pianos. Those of the family who have the company now continue to improve the quality of the pianos. Charles Sterling took over the Birmingham Organ Company in 1871, formed the Sterling Company in 1873 and began producing pianos in 1885. This company was very successful in the player piano. Charles Stieff taught music but came to America from Stuttgart. He imported pianos from Germany to his warehouses in Baltimore. He returned to Europe where he studied the manufacture of Pianos, returning to Baltimore and began making the Stieff piano. When Stieff died his sons, taught by Stieff himself, took over the company. They have stores in most of the larger cities of the U.S. where their pianos are sold. Story was the music piano maker of the west. He began in Vermont, teaching music but then manufacturing pianos-the first in Vermont. He was offered an organ dealership in the west, which he took and met Clark in Chicago. Clark became a partner. When Story retired his son joined Clark and they began manufacturing reed organs. The company expanded . These organs were the highest in quality and tone. Clark began his own company, but Story continued in the piano business. They distributed their own pianos to their own warehouses throughout the U.S.
Vose began as a cabinet maker, and began making pianos after much experience in Boston. His three sons were brought into the business, and after Vose retired, continued to improve the company. Forced back into the world of business after an acquaintance stole the majority of his retirement money, Luman Birch Wing started a piano manufacturing business in New York City with two partners, Doane and Cushing. 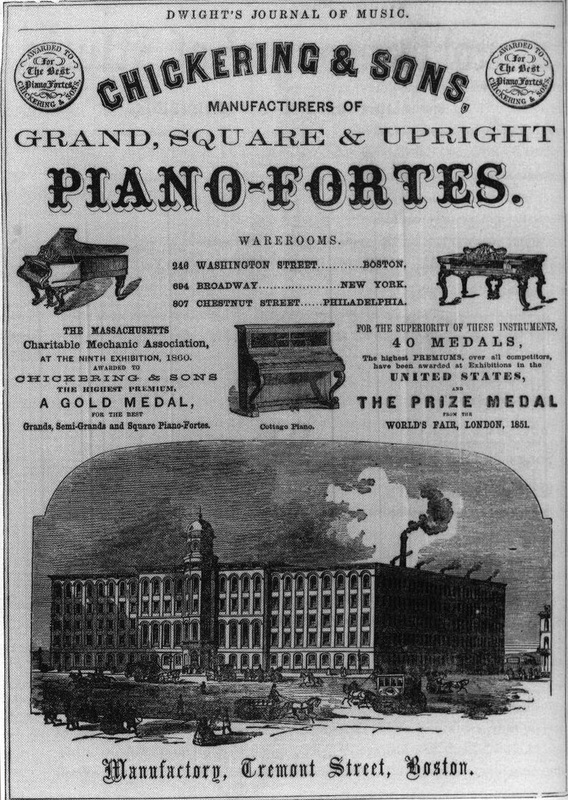 Their infant enterprise was one of only fifty or so factories producing pianos immediately after the civil war, and the business officially became the Wing & Son Piano Manufacturing Company in 1873. Wing & Son was the first company to market ‘mail-order pianos’, shipping their instruments free of charge to just about anywhere in the U.S. with a train station. Wing & Son pianos, besides being high quality and often very decorative instruments, gained notoriety for equipping their pianos with five pedals – the two extra pedals changed the tone of the piano, one made it sound like a mandolin and the other gave the instrument a ‘rinky-tink’ sound commonly associated with a honky-tonk piano. Rudolph Wurlitzer came from a family of musical instrument makers in Germany to New York then to Cincinnati where he imported instruments. His son came into the business. This company has become the largest manufacturer of mechanical instruments and player pianos with global connections. Torahusu Yamaha began making musical instruments in 1880. In 1885 he made the first organ in Japan. The Japanese Musical Instrument Manufacturing Company patterned its pianos, organs and violins after American and German models. One of the sons of the owners of this company learned piano making in New York at the Estey factory. 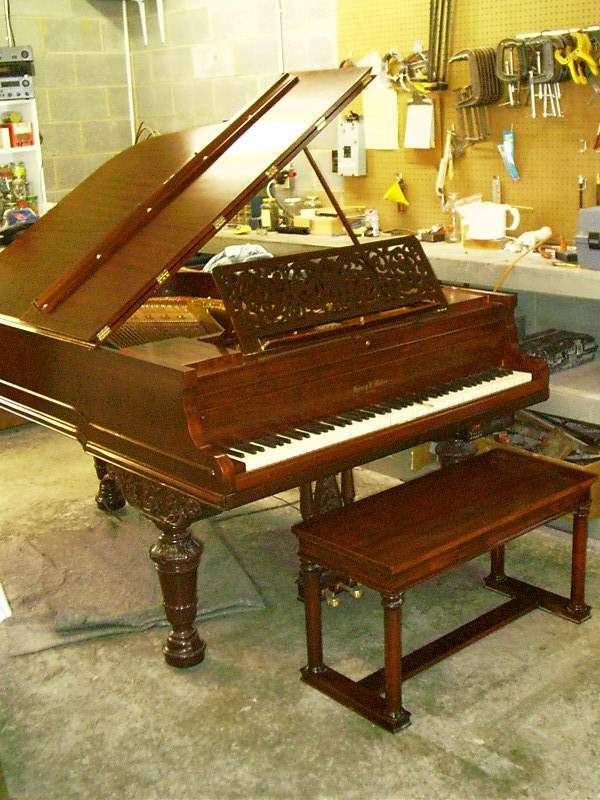 Interested in Restoring your Antique Piano? Our technicians will offer you specific recommendations based on your piano model, so call us today at 828-277-5566 to discuss your restoration needs.